"If you have nothing to hide, surveillance won't bother you." One may argue that surveillance devices and cameras are ubiquitous and widespread, they track our credit cards, our mobile devices and all of that...How can you expect privacy in this "Brave New World" that we live in? The answer is: You Can't; but that doesn't mean that you need to carry around a device that is designed with security flaws that allow the NSA and other entities to use it as a surveillance device against you, at your own expense. Right now: you have the option to pay cash, to leave your cell phone and mobile device at home, and go someplace where there are no surveillance cameras. Don't contribute to "Big Brother" AKA The Surveillance State, by using your own money to purchase and use a device that is poorly designed when it comes to personal privacy. The NSA and other agencies will still track you passively, so far and as deep as their budget and infrastructure allows them. "The Surveillance State" can not afford to put microphones and cameras everywhere you go; but they can quite easily, and quite inexpensively spy on you, and all the people around you through the "shiny, happy, little devices" that you voluntarily carry nearly everywhere with you, almost every single day of your adult life. Your cell phone has "Big Brother" on the "other end" 24-7-365 don't ever forget that! non-removable, always on, wireless internet connectivity. All of Tesla's vehicles contain an always on internet connection that can not be physically removed from the vehicle. of the vehicle, is for driver safety, and to ensure that the vehicle is functioning properly at all times. We see this as the #1 upcoming threat to privacy in the 21st. century. devices that are designed in a manner consistent with individual safety and privacy. You can change this trend if you voice your concerns when purchasing a new car. 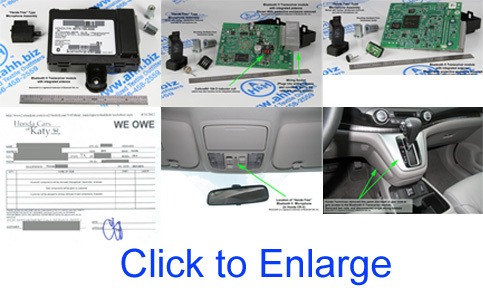 Pictures detailing removal of Vehicle Bluetooth® components by new car dealer at customer's request. An acquaintance of ours (we wish to respect their privacy so we will refer to them here as "Pat") was recently shopping for a new car. Pat wanted to do something that was environmentally responsible and purchase an Electric car. There has been a lot of Hype regarding Tesla's new cars; so Pat decided to start the shopping there. Pat recently heard that Tesla motors was building a non-removable internet connection into their new vehicles. apparently they are making it appear to the general public that the built in, non-removable, always on internet connection is for "safety" so that the vehicles' systems can be monitored in real time to ensure their safe functioning. We don't buy it, and we don't think you should buy it either. (figuratively or literally). While its true that you can't do much about the NSA surveillance or malicious hackers while using internet connected devices, you can lower your exposure by employing common sense, and purchasing products that are well designed from a security standpoint. A device that has non removable internet connectivity, does not reduce your exposure, it obviously increases it and should be avoided at all costs. Where we discussed this issue with some individuals who appeared to have a very high level of knowledge about Tesla motors products and design. We suspect some of these individuals were employees of Tesla, but due to the nature of online conversation; there is no easy way for us (lacking the NSA's capabilities) to prove it. These individuals on Tesla's web forum convinced Pat to look elsewhere for a new car, mostly ridiculing Pat's concerns about the built in, always on internet connection in Tesla vehicles. So look for another vehicle manufacturer is exactly what Pat did. After some more searching on the web, Pat discovered that Honda has several alternative energy vehicles. Honda is an established automobile manufacturer, with an enormous amount of experience in building and servicing automobiles. Pat had previously owned a Honda, had no problems with it after several years of ownership, and therefore decided to purchase another one, and ignored all of the recent hype over Tesla motors. The only problem was that the Honda that Pat wanted to buy, had a built in Bluetooth® connection; while this is not as bad as having a built in internet connection; it still bothered Pat, because of the built in microphone capable of recording a whisper and the ability to transmit that whisper via a short range digital radio signal at 2.4 to 2.485 GHz (which by the way; is higher than the radio frequency used in a Microwave Oven). Reluctantly, Pat finally went to the local Honda dealership to get an "in person" look at the vehicles that Honda offers; not expecting to purchase a vehicle that same day, but still open to the idea. Pat expressed these concerns with the very helpful Honda sales staff, who said that removing the Bluetooth® module and microphone from any Honda vehicle Pat intended to purchase was not a problem, and in fact their Honda Service Department had done so before for other customers. Furthermore, the Honda dealership would remove the Bluetooth® module and microphone for Free!! This work order also specified that Pat could witness its removal. Still skeptical; Pat, BEFORE signing any financing & sales contracts, insisted on signing a work order contract for the free removal of the Bluetooth® module and microphone. The Honda dealership performed this service promptly after the vehicle was purchased, even allowed Pat's friend to witness (but not video tape) the removal of the Bluetooth® module and microphone. The whole removal process took one Honda technician about 1 hour to perform with basic, non specialized hand tools such as screwdrivers, open end wrenches, and socket wrench. busy collecting info on Millions of us; Innocent American Citizens. How did this guy get a Security Clearance?....dumb-asses! Bluetooth® already used for passive tracking and surveillance on U.S. roads without notifying the general public. This recent news about Tesla Motors applying an "Over-the-Air" software fix, further proves our point about Tesla vehicles being potentially susceptible to malicious internet borne hacking. If the Tesla Vehicle can be prevented from operating in a dangerous or life threatening manner by the mere application of an online "software upgrade", then it is logically confirmed: The vehicle is vulnerable to being made to operate in a dangerous or life threatening manner by the mere application of internet borne malicious code (a computer virus downloaded from the internet). It should be abundantly clear to any intelligent person: It is not a question of "IF" Telsa vehicles can be hacked, it is only a question of "WHEN". 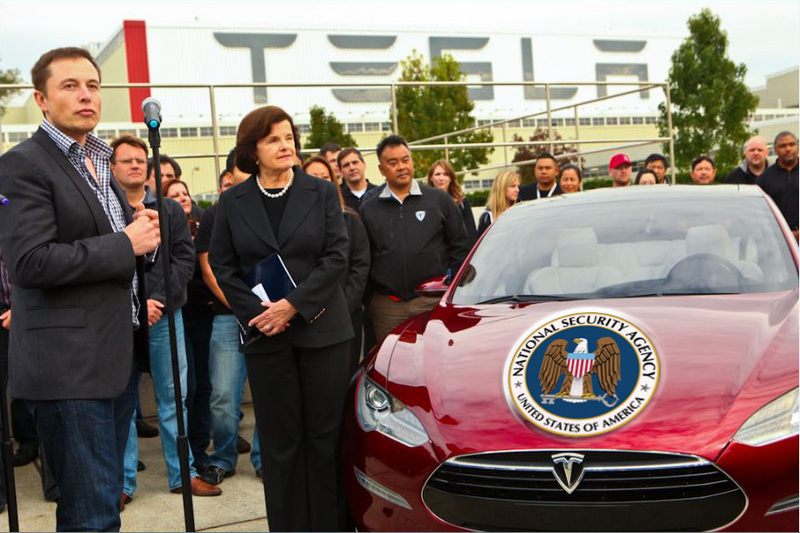 Please note Mr. Musk: We are not against electric cars, or viable alternative energy. We are against your vehicles because of their built in internet connection that can not be removed or shut off. If you want to change something for the better, and improve the lives of us "common folk": devote a few million dollars to researching, developing, and deploying a Hydrogen / Electric Hybrid energy storage system for automobiles. With the intention of eliminating our dependence on "Big Oil" and other centralized, corporate dominated means of energy production. Oh... and leave out the internet connection in all your vehicles... Peace, Bro! See a trend here? The more automated and computerized we make any device, the more vulnerable to hacking and surveillance it becomes. We as consumers of these digital products need to think long and hard about the privacy and safety implications of owning all these shiny new gadgets. We need to balance our enthusiasm for new technology with pragmatism. We need to ask ourselves: Is this new feature or technology worth sacrificing my safety and privacy? How can this new feature be used against me by computer hackers, or by my government in the future? We are not saying, nor do we believe that the government is building a surveillance state, but the more we as consumers embrace this intrusive technology that continues to whittle away at our privacy, the easier it will be to construct a surveillance state, should our government have that ultimate intention. "Intentions mean nothing, capabilities mean everything"
Be responsible with with your stuff, remember where the heck you put your keys, and you will never need this tiny, but powerful Orwellian Threat to your privacy: the "Tile"
Tile App, Now you don't even need to carry a mobile phone for the NSA to track your movements. 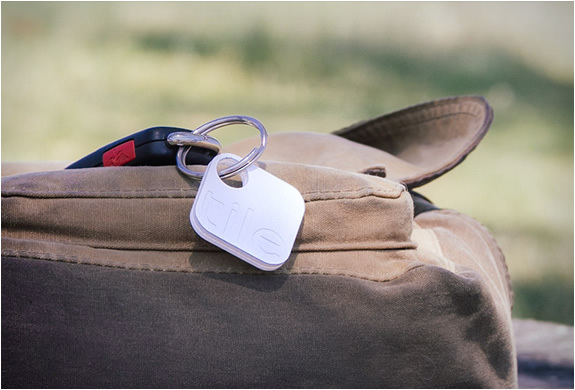 Tile uses an always-on Bluetooth® transmitter that communicates to any nearby Bluetooth® enabled device. The Tile device with sealed, self contained battery is specifically designed to use nearby cell phones and mobile devices as a radio repeaters to get this thing's location transmitted to the network and subsequently into NSA's data stream, and it has no on/off switch. Pretty small and easy to sew into a backpack or jacket, or simply drop into a pocket, or attach to the undercarriage of a car with double sided tape. Satellite Navigation Systems (Global Positioning System) - GPS: its not as bad as you think when it it comes to privacy. GPS devices by themselves do NOT constitute a real Time threat to your privacy, because GPS technology only involves one way communication from the GPS satellites to your GPS unit. Your GPS unit as a stand alone device is only a receiver, it CAN NOT; by it's self transmit your location, direction and speed of travel. Do keep in mind though: these GPS devices keep DETAILED FILES of your whereabouts, direction of travel and speed of travel, all of it; time stamped for easy tracking. 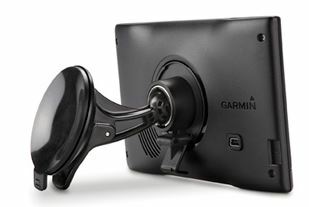 We like the Garmin Nuvi® 52, it is a fine GPS receiver unit, easy to use, works well, and most importantly does NOT have Bluetooth® built into it. Although GPS technology by itself, (not built into your car or mobile device)but merely as a stand alone unit such as a Garmin Nuvi® is pretty safe regarding privacy. However, do not buy a Garmin or any other brand of GPS unit that has Bluetooth® or FM transmitter, or any other wireless transmission protocol. The danger in having a Garmin or other GPS device with Bluetooth® or other transmitter built in is: now with a transmitter, this device is capable of being accessed remotely, thus both malicious hacking and real time surveillance now become possible. Another very important issue regarding Garmin GPS: Map updates, You must connect your Garmin via as USB cable to an internet connected computer in order download and install new map updates to your device. In doing so, your Garmin can now be accessed by the NSA while it is connected to your computer and the internet. The process of downloading the new maps, takes nearly an hour, even with the fastest internet connection; so it's safe to assume that during this file transfer, the NSA is able to get copies of all your travel information. We recently (September, 2013) contacted Garmin and asked them if there was a way to download and install the map updates without connecting our Garmin to the internet via a USB cable to our computer; they said NO, and there are no plans for it in the future. We further inquired how we could get map updates without internet connectivity. 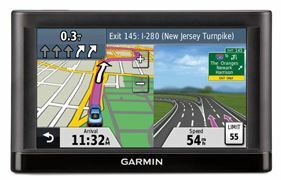 There is a way: you must call Garmin and ask to purchase the map updates on SD card for about $79 (USD), apparently you must provide them with your unit's serial number and other personal information. In our opinion: The best way to update your Garmin's maps without compromising your privacy, is to simply buy a newer model when it is released. However, don't pay extra for the model that comes with lifetime maps that you must compromise your privacy and security in order to download and install. Garmin makes several models of GPS unit, usually you can tell very quickly by the model number suffix "LM" if the unit includes lifetime maps for example the Garmin Nuvi® 52 and the Garmin Nuvi® 52LM which is about $20 (USD) more expensive. One more thing about GPS: ALWAYS avoid purchasing vehicles with built in navigation systems. Aside from the navigation system becoming outdated before the rest of the vehicle; privacy is greatly sacrificed with a GPS system that is integrated into a vehicle. It is much easier to make a device the size of a mobile phone "disappear", than it is to rip out the wiring and components of your vehicle to conceal your travel information; should "Big Brother" come a calling. Cell phones are almost indispensable today. About 50% of the adult population now carry cell phones, most of those, smart phones, which contain cameras, internet connectivity, text messaging, GPS and enormous memory capacity. The very nature of how a cell phone operates make it an inherent tracking device: Each phone has a unique digital serial number and electronic signature that is transmitted nearly constantly to the cell network, for identification for billing purposes. The phone automatically accesses several cell towers and selects the one with the best reception, in doing so; the user's position is triangulated via signal strength detection, within perhaps 200 feet (less in urban areas with more cell towers). So even without built in GPS, a cell phone is a pretty useful tool for tracking people. Add GPS to a phone, and now your position is able to be tracked and monitored by the network to within 10 feet. Add a camera and a hands free microphone which can both be turned on without the user's knowledge, and now you have a mobile surveillance device carried around by half the adult population; a real time, global awareness program monitored by the NSA and other agencies. But wait! there's more.... use ANY Bluetooth® device within 50 feet of a cell phone, and the cell phone can act as a radio signal repeater, with the capability of picking up ANY Bluetooth® data signal and repeating that signal to the cell network where it becomes part of NSA's data stream. This scenario is totally possible and within the operating capabilities of all smart phones capable of linking to Bluetooth® devices. 6/5/2015 update: Additional info about Bluetooth, IBeacons, Fitness Monitors and other wearable devices. Additionally, due to the speed and complexity of the operating system of a smart phone and the speed of the cellular/ data network, it could be done without the knowledge of the user; heck, you wouldn't even notice a drop in internet speed, or any indication whatsoever that this was happening. When you go shopping for a new phone, most stores don't even display the simple cell phones anymore. If you ask, they may have a basic phone in the back storeroom without internet connectivity, cameras and other non essential gadgets. The reason you have to ask the salesperson a phone store to see a basic model, and the reason these simple phones are not on display is because the phone companies have no interest in selling you such a basic phone. They make a lot more money by selling you a phone that is internet capable because the real money for the phone company is in selling you a data plan, which most people will exceed, not just basic voice phone service. John's Phone Comes in several colors, and is probably the most simple basic phone you can get. Not the most well made phone available, but probably the best you can get from a privacy standpoint. Smartphones and wireless communications: It's not just about privacy anymore, it's about your health and well-being. Radio waves / electromagnetic radiation in the microwave bands (1 Ghz & higher) are hazardous to your health. This fact was known for years, but it doesn't get in the way of Telecoms & smartphone manufactures making money and downplaying the risks. 5G is a particularly dangerous threat as it operates at frequencies of 28 Ghz, 37 Ghz and may be approved for frequencies in the 100 Ghz range. Additionally, due to it's higher energy but reduced useful range, 5G comms systems must be deployed in closer proximity to users, which means more transmission towers, closer to more people, increasing exposure to this harmful radiation. 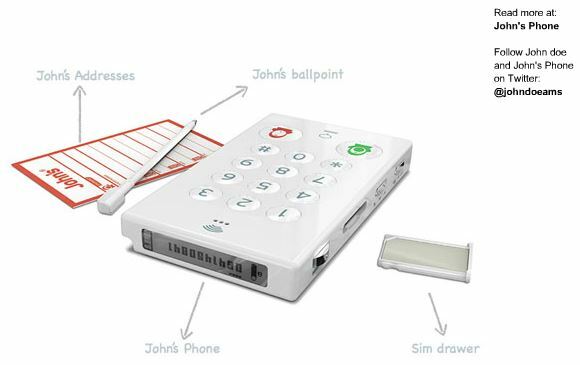 Here is an interesting development to follow: Purim Librem 5 – A Security and Privacy Focused Phone We can't vouch for it, but the concept of hard (physical on/off) switches for camera, microphone, Bluetooth and other components, and an open source Linux based operating system makes this phone worth watching for those concerned about their privacy. Apple's fingerprint technology uses skin resistance measurement, the same way that a polygraph (lie detector) does. After you use the phone enough of times Apple and the NSA can start to build a profile on you and begin to ascertain your emotional state every time you unlock your phone. For example: if on several occasions a certain skin resistance reading precedes you writing an angry e-mail or text message, they then could know what your emotional state is, with pretty high certainty, without you even typing or speaking a word. Maybe advertisers will use this "emotional state" information to flash you advertisements when you are emotionally compromised and in a vulnerable state and more likely to be taken advantage of by the advertising. Maybe law enforcement will use this "emotional state" information as circumstantial evidence, trying to pin a crime on you that happened in proximity to you and your phone. The questioning might go something like this: "We know you were at the party where so-and-so got shot; you were feeling pretty angry at that time, as evidenced by the skin resistance reading from your iphone; nobody else's iphone registered them being angry at that party at the time of the shooting; you are now under arrest; you have the right to remain silent...."
for the low frequencies used on these devices. lower frequencies (lower than 100 mhz.) is very likely fraudulent. hack the signal up to 35 feet. The extremely fast connection times associated with NFC means that a signal could be effectively transmitted and received from a moving vehicle near an automated toll booth, or even a light pole equipped with a NFC reader. Not much information can be transmitted in that short time, but certainly enough meta data to establish the identity of the device's owner, thus establishing a time stamp of when that individual passed a certain location. Segregating your Online & OFFLINE computing activities for enhanced information security. Rule # 1. NOTHING that is connected to the internet is secure. Even the United States Government, Department of Defense; that spends more money than the combined Gross Domestic Product of several small countries; on internet security infrastructure; can not protect it's internet connected computers from hackers 100% of the time. What makes you think that your $800 piece of crap computer with "Gortons internet security suite" or "McLaffee Internet Security Suite Plus" is going to protect your information from any hacker with enough skills? USB sticks and other storage media can contain malware, that can "steal" information from "air gapped" machines and transfer it to any machine that storage media is connected to. See: Air gaps: Happy gas for infosec or a noble but inert idea? Rule #2: Any information on a cell phone "belongs" to the NSA. Also very likely: as does any conversation held within "hearing" of a cell phone's microphone, or anything in view of a cell phone's camera. Conclusion: If you really want to keep something private; don't put it on a computerized device or cell phone, don't discuss it within "hearing" of a computerized device or cell phone, and don't let it happen in front of the camera of one of these devices. Do with this knowledge as you please, but a word to the wise: the NSA has the capability to take in, and store all of this information indefinitely. So if you wouldn't say or do something in front of a Federal Agent, don't say or do it in front of a computerized device or cell phone. "If you are able to read this text today, in 2015 or later, without the aid of reading glasses, your generation will live to see the day when the data gleaned from your personal electronic devices will be used as evidence against you in any local or U.S. Criminal Court, without a warrant, or much less your consent, the same as if you had said or done the deed in question; right in front of a law enforcement officer." Start assessing how you use the your Computers & Computer Applications. To each his (or her) own: figure out what programs and applications absolutely need internet access and which DO NOT! Obviously, e-mail and web browsing and other web applications need internet access. Don't purchase software that can not be installed, registered, and activated offline, or from a different computer. Many software manufacturers are now designing their software so that it can be installed, licensed and registered on computers without an internet connection. Normally, in addition to a serial number for the application, they e-mail you a program, usually a small EXE file that generates a unique hardware ID for your computer (probably based on your OS serial number / product key), you send them the hardware ID and they send you back a registration code that will activate the software for use on that particular computer only. Thereby they ensure you are not installing their software on multiple computers without paying for additional licenses, and you ensure that their software is not spying on you and calling home to it's "master" via your internet connection. They don't actually list the offline activation option on their website, but if you e-mail them and tell them your computer does not have internet access you can download their offline activation HID generator and they will e-mail you back an activation file to use on the offline computer. What is all the worry about regarding computer information security? Our security concerns revolve around security vulnerabilities that were allegedly, intentionally built into all of Microsoft's operating systems, and all widely used Encryption Software produced by American based manufacturers. Recently revealed anecdotal evidence from multiple sources suggest and allege that such security vulnerabilities were implanted at the behest the U.S. government through the NSA, into all of Microsoft's products, and all widely used Encryption tools produced by American based companies. Obviously, "John Q. Public" does not posses any information that would be of great importance to NSA; however; such inherent vulnerabilities in the computer's operating system and encryption programs could be exploited by other groups and individuals with financial interests and result in a theft of financially advantageous information which may be held on the computer, or information that could be used for blackmail or other nefarious purposes. This is why keeping a separate computer or computers that are never, ever connected to the internet, is an essential part of information security. Concerns about radio transceiver devices built into USB flash drives, USB cables and other USB accessories that are capable of surreptitiously transmitting data to an attacker; from a computer that is NOT connected to the internet are also legitimate; but unlike internet based spying, spying via a radio transceiver device requires close physical proximity to the target, possibly 500 meters or less. (however, it is highly likely that any internet connected, Bluetooth enabled device or a Smartphone could act as a repeater for radio signals transmitted by a low power device that could be hidden in a USB appliance, rendering it's effective range infinite via the internet. If radio transmitters embedded in USB cables and other computer appliances is a concern for you, Gnarly Wraps Hose & Cable Protectors layered with Stainless Steel Fabric are designed to fit over cables and provide protection from abrasion & cutting primarily, but can be ordered with the stainless steel fabric integrated into them. This integrated Stainless steel mesh fabric (if properly grounded) will greatly reduce the effective range of radio transmissions that may emanate from from the cables due to inherent RF leakage (naturally common to many types of cables), as well as RF from possible hidden transmitters, which may actively transmit signals. We speculate that this cable has more than one layer of "shielding" with the external layer being a "fake" un-grounded metallic layer designed to appear as shielding, but not grounded, and instead functions as the antenna of the transceiver. The "real" shielding for the cable may be contained below the "fake" shielding and separated by a non conductive layer, so both the "real" shielding works to prevent RF interference from affecting the "normal" overt operation of the USB cable, while the outer "fake" shielding serves the covert operation of the cable, allowing it to send and receive RF signals at far greater distances than would be possible if they attempted to conceal a miniature antenna in the plug end, where presumably the rest of the electronics for the covert transceiver would reside. If you are going to set up multiple computers and connect them to a shared Keyboard, Monitor and Mouse, don't use a KVM switch with USB and/or DVI ports; especially if it utilizes "hot keys" to switch from one computer to another. For example: You have your "Dirty" internet connected computer connected to a digital KVM switch that uses USB for mouse and keyboard. You have your "Clean" offline computer which is not hooked up to the internet, using USB for mouse and keyboard, and also hooked up to the same digital KVM switch. THIS IS AN INSECURE SETUP !!! Don't do it, and expect that your "clean" offline computer will stay segregated from from the internet. Two problems here: 1. 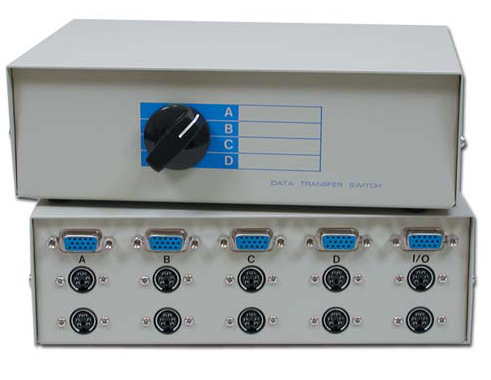 USB sends data both ways and 2. your KVM switch is controlled by your computer which can be compromised. So now you have a USB data link between these two computers that you can not physically control. It may be "Ancient and Clunky" but it still works and it's secure if used properly. You may have to shop for new computers with a mother boards that still have ps2 mouse and keyboard ports, but if information security is important to you; this is what you need. 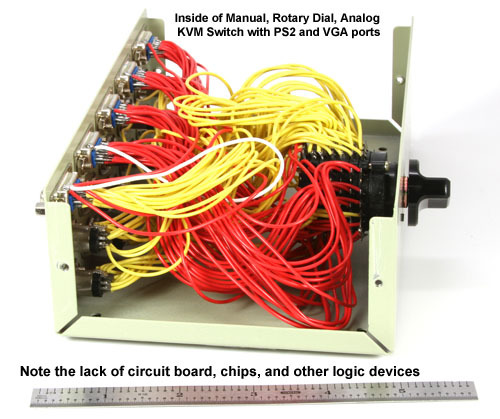 A Mechanical KVM switch contains an old style, rotary knob switch that PHYSICALLY disconnects electrical outputs on one computer from the monitor, keyboard, mouse BEFORE physically connecting to another computer, so there is NEVER any possible data link between one computer and another. 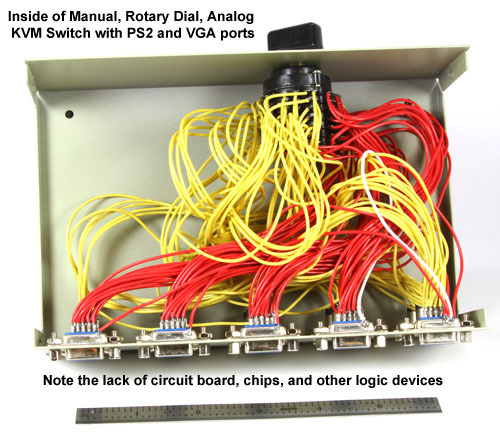 There is no circuitry, no board, no chips, and transistors inside the box of this KVM switch, just a "Clunky, Old School" switch and a bunch of soldered wires. chips and other logic devices. If privacy, and occasionally "stepping out of the grid" is important to you consider the following: Many Cell phones made today, have non removable batteries and therefore continue to transmit radio signals that communicate with cellular network antennas, located on towers, buildings and other tall structures.